Sleek and spacious, the Spirit of Freedom offers one of the best in live-aboard dive cruising to the famous Cod Hole and Ribbon Reefs. This tour begins every Monday from Cairns, and travels along the rarely visited Ribbon Reefs, finishing 240 km to the north at the world famous Cod Hole. 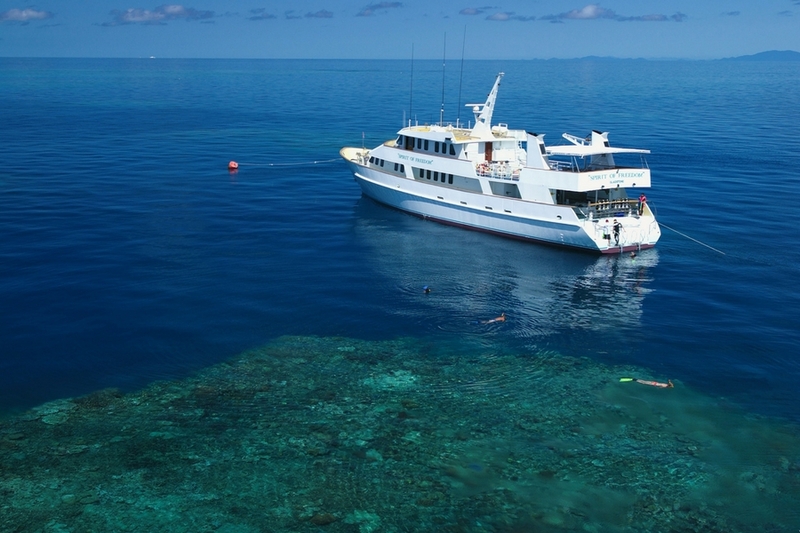 With the chance to do up to 11 dives you'll get to see the best of the Great Barrier Reef, building your dive skills and immersing yourself into the famous corals of the world's most well known reefs. Your last night is spent on board the Spirit of Freedom in the bay at Lizard Island. Enjoy time ashore at Lizard Island the next morning, before boarding your return flight to Cairns. The one-hour, low-level scenic flight back will arrive in Cairns around 11:30am on Thursday. This is a once-in-a-lifetime opportunity to experience one of the worlds' greatest wonders, the Great Barrier Reef! At 37 metres, Spirit is one of Australias largest liveaboard dive vessels with on board facilities to satisfy the most discerning dive traveller. Electronic stabilizers ensure the smoothest cruising, while the comfortable furnishings and polished timber interior, give you the feeling of being on a luxury private yacht. Passenger entertainment areas include sun deck, lounge/ bar and huge dining saloon with wide screen TV/DVD system. Theres also a large fully equipped dive deck with Nitrox and photo facilities. 11 roomy cabins all feature private bathrooms and are serviced daily. Monday: Your courtesy bus will pick you up around 11:00am to bring your to the Spirit of Freedom boat at Trinity Wharf. You'll be greeted by the friendly crew where you'll get a quick orientation for departure at 12:00pm. Enjoy a delicious lunch while we cruise to the Great Barrier Reed for an afternoon dive, and perhaps a twilight or night dive. After dinner you'll cruise to the Ribbon Reefs. Tuesday and Wednesday: You'll spend most of your days on Tuesday and Wednesday diving on Ribbon Reef, on number 9 and 10 reefs. Dive sites are whether dependent, but you'll always include at least one dive at Cod Hole to see the giant Potato Cod family that live there. Other sites include Wonder-wall, Pixie Pinnacle, Challenger Bay, Two Towers, Lighthouse Bommie, and the Snake Pit. With the right currents you'll get the chance to drift dive at Dynamite Pass, well known as a channel for sharks to pass through! With four to five dives available each day, including a night dive on Tuesday, you'll get to see all the best parts of the reef. Wednesday evening you'll anchor at Lizard Island and enjoy a BBQ dinner on the deck while watching the sun go down. Thursday: After a delicious breakfast in the morning you will disembark the Spirit of Freedom for the last time, where you will get to enjoy some time on Lizard Island. Enjoy a guided walk from Watsons beach to Mary Watsons cottage over Chinaman's Ridge and back to the air strip, where you will board your aircraft back to Cairns. You'll enjoy a relaxing one hour flight, arriving back to Cairns between 11:15am and 11:30am. Your shuttle will meet you there and bring you back to your accommodation in Cairns city. * Please note that this is an example only and is subject to change. ** Snorkellers can best snorkel at Ribbon Reefs, with Coral Sea locations only suitable for experienced snorkellers. You may not be able to snorkel at every site, weather dependent. 6 dives on the remarkable chain of Ribbon Reefs with varied topography featuring coves with expansive beds of plate corals to isolated pinnacles, home to clouds of colourful tropical fish. Departs/Ends: Cairns. All bookings MUST reconfirm 48hrs in advance. Ph: 07 4047 9150 or from outside AU: +61 7 4047 9150. Due to light aircraft weight restrictions, your total luggage weight is limited to 20kg/45lb per person. All bags must be soft sided.